Chris James Mind Body Hello Aloe provides a fantastically rich cocktail of vitamins, minerals, trace elements, and has a strong anti-ageing effect. Hello Aloe may help with regularity and increases protein absorption. It may also help to decrease the amount of unfriendly bacteria and yeast in your gut. Hello Aloe can be ingested and absorbed topically and may increase collagen synthesis and skin elasticity too. Potassium sorbate, Sodium benzoate, Citric acid. Recommended intake 8 drops per day to be mixed with 100ml water or a freshly pressed juice or smoothie. Do not exceed recommended daily intake, unless directed by a healthcare practitioner. Do not use if the sealing strip is missing or broken. Store in a dry cool place and out of sun light. 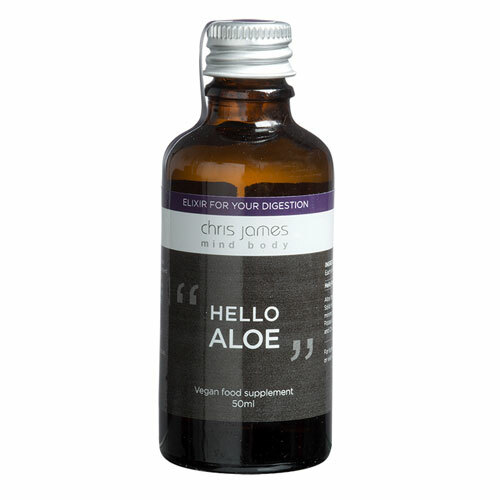 Below are reviews of Chris James Mind Body Hello Aloe - 50ml by bodykind customers. If you have tried this product we'd love to hear what you think so please leave a review. Great product, it's very strong. so be careful. Would buy again.